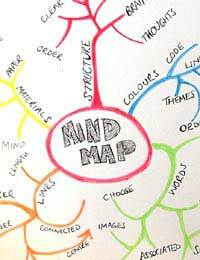 Many companies use mind mapping at work as it’s often a much easier method of establishing connections between ideas and concepts and helps people to learn more easily. Whether you use an office whiteboard, a flip chart or some other kind of visual aid at work, a mind map begins with the central theme in the middle from where you make your connections by branching out in various sub-sections which, though not necessarily related directly to each other, they’ll all have a correlation to the central theme you started with. They’re often useful for brainstorming or planning exercises or by those who prefer to learn by using visual imagery at work. Here are some of the more typical examples where mind mapping can be used at work. If you’re looking for inspiration and creative ideas, mind mapping is very useful as it’s a method which often relies on brainstorming calling for instinct and intuition as opposed to methodically working out a problem or coming up with an idea. Companies can use it to help with defining their company mission statement or corporate identity programme as well as in problem solving and scoping out projects. Difficult decisions can often be reached far more quickly and with more certainty using mind mapping. Most people are familiar with the kind of diagrams that use yes/no questions and upon the answer you give, you move in one direction to the next question, or in another direction to a different question and so on and so forth until you reach the answer that’s most appropriate having steered a course to the end to get to it. Mind mapping can help in planning various work projects too. Organising, prioritising and time management can all be incorporated into this kind of mind map. It’s also useful in this instance as it allows people to see what their own responsibilities are as well as enabling them to see what other team members are working on simultaneously and how it all fits together to form ‘the big picture’. Mind maps are also used a lot by people at work who may be involved in giving presentations or speeches. Because mind maps can be kept on one page, it enables communicators to remember where they are up to. It helps them remember their lines better and also allows them to keep abreast of the time and what amount they have left to fit into their speech or presentation. This is particularly important if the speech or presentation needs to be no more than a certain length. They are also used a lot in learning and can often help to demystify concepts which are particularly complex to grasp and many people will say that it helps them to learn more easily. In a similar fashion to the above, meetings are usually scheduled to only last a given period of time. Therefore, mind mapping is handy for jotting down the issues that need to be discussed such as the minutes from the last meeting and the agenda as well as building in time for the various additional items on the agenda that are to be discussed. By keeping to the mind map, it enables both the chairperson and the people attending the meeting to stay ‘on subject’ and not to deviate from the topics on the agenda. If you’ve attended formal meetings you’ll know that when people go ‘off topic’, it sometimes means there is not sufficient time to discuss the things that were listed towards the bottom of the agenda but, nevertheless, were meant to be discussed. Mind maps, therefore, can be a very useful mechanism and can be adapted to suit many areas of business.